Conspiracy for Murder is the misuse of power and how it causes people to be led into doing things which they might not normally do. It also centers on how people are easily manipulated by fear. The main character, Detective James Gladd, is a man who has overcome some of his own demons and now, due to his involvement in solving a tycoon’s mysterious murder, must face different demons, both figuratively and in reality. He is aided in this venture by a detective who, due to her own case which is linked to Gladd’s, joins in his hunt, and a wealthy techno-nerd who has a fondness for disguises. This book is now available for purchase! The shrill call of Dewey Linden’s mother was better than having an alarm clock. Even though Dewey was a heavy sleeper, his mother’s voice was such that he often told her that it could bring the dead back to life. Dewey had been taking his afternoon nap, as usual, and the call to supper, or any other meal, was a sure-fire way to make sure that Dewey’s daily need for nourishment was fulfilled. Although he didn’t consider himself obese, just well-fed, 200 pounds for a man of 21 years of age and 5’7” was, as his mother said, “healthy”. When he was a teenager, he had been fifty pounds heavier, but joining the high school wrestling team had helped him lose some of that weight. He still lifted weights almost every day whenever he was in the mood, but the summertime heat tended to cause him to lose interest. Dewey was used to his mother’s threat to kick him out of the house if he didn’t get a job, but he couldn’t find a job that he really liked. He supposed that some people might consider him lazy, but he preferred to think of himself as choosy. Since he was 18 years old, he’d had twenty jobs. He lost most of them because he couldn’t stand working with other people. If he could find a job that paid well and didn’t have him dealing with a lot of people, Dewey would be happy. Early the next morning, before his mother woke up, Dewey loaded up his beat-up Toyota with his fishing gear. He had gotten into this habit because of his mother’s constant harping about getting a job. He left the house just before dawn and drove a couple miles outside of the city limits to a spot that he remembered that his father used to take him to when Dewey was a kid. It was under a magnolia tree which grew on the bank of the Mississippi River. Dewey would set up his fishing pole, sit with his back to the tree and read the newspaper. He would be sure to read the Want Ads so that when he returned home, he could honestly tell his mother that he had looked for a job. In order to make his story more believable, Dewey would release any fish that he caught instead of taking it home with him. Dewey decided that if he brought his catch home, even if it would be contributing to the household, it would be better to not give his mother a chance to tell him that he was wasting his time. Sales rep wanted. Minimum wage plus commission. Must have own transportation. Call 555-9555. Ask for Zeke Doumant. Dewey thought hard about every sentence in the ad; he wanted to make sure that what the position was offering would fit into his own criteria. Since he had not got any bites on his line, he decided to put an end to his “work day” and go back into town and call about the job. When he arrived back in town, he went into the Newberry drug store, put a quarter into the pay phone and called the number from the paper. The phone on the other end rang twice before it was answered by a woman’s voice. Dewey hung up the phone and went out to his car. He wasn’t exactly happy about what Mr. Doumant had told him about the job, but he decided that he had to fulfill his promise to be there. Maybe it wouldn’t be as bad as Mr. Doumant had said, but he had to make an honest effort to try, if for no other reason then to satisfy his mother’s expectations. Dewey soon arrived at the address he had been given and parked his car. He entered the building and asked the woman at the front desk for Mr. Doumant. She phoned into his office and then told Dewey to go on in. Mr. Doumant turned out to be a man who appeared to be in his fifties with a ring of white hair and rosy cheeks. Dewey was a couple inches taller than him but that was really irrelevant. Dewey sat in the chair that Mr. Doumant indicated to him and Mr. Doumant instantly started to ask Dewey some questions. With the interview over, Dewey left the office, gave the secretary his name and telephone number and left. During the interview, Dewey had felt slightly uncomfortable. He had answered all of the questions without stuttering, but had felt some sweat form on his forehead. He sat in his car for a minute, looked at his watch to see what time it was, and seeing that it was time for lunch, he drove home. His mother was not home when he got there, so he made himself a peanut butter and jelly sandwich, poured himself a glass of iced tea and went to the living room and watched TV. After finishing his lunch, he went back out to the living room, turned off the TV and took a nap on the sofa. By the time that he had awakened from his nap, Dewey’s mother was home. He told her about his interview and that he would probably get the job. Just as he finished telling his mother this, the telephone rang. Dewey answered it. It was Mr. Doumant calling to tell Dewey that he had decided to hire him and expected him to come into work the next morning. Dewey’s mother was happy to hear that her son had finally gotten a job. She gave him a kiss on the forehead and then went into the kitchen to begin making dinner. In the meantime, Dewey began to think about what he had committed himself to; a job that required him to actually talk and persuade people to buy products that they probably didn’t need or want. He thought about the job all through dinner and even missed watching his favorite television show. By the time that he was ready for bed, Dewey had made up his mind. Dewey had decided that, even though it didn’t pay anything, the best job that he could cope with was working on ways to get out of working. His fishing pole was back in his car the next morning. 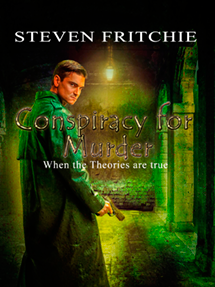 The title for this book will be changed to “Conspiracy for Murder”. Jeremy Wallace heard his mother’s yelling, but he remained stubborn. He refused to go to the dentist because his friends at school had told him horror stories about what went on there. Even though he was eight years old, he still believed in the Tooth Fairy. He preferred to believe that any problems that he had with his teeth could be solved by going to sleep at night and that when he woke up, the teeth would be taken care of and that he would find a dollar under his pillow. His mother had told him that that only applied to teeth that had come loose or fallen out, but he believed otherwise. I believe that dreams can be one of three things. The first kind of dream is the prophetic type which usually occur in many famous works of fiction. The second type of dream is symbolic, which is liberally seen in the works of the master artist Salvador Dali. The third, and final, type is the one that I like to call “a mishmash of one’s daily tensions used as a relieve valve”. The following short story is a mixture of the last two. All characters and locations are real up to a point. The characters are real, but their names have been changed just for the heck of it. As for the locations, well, I admit that I’m winging it. Enjoy! Gladd found the trapdoor that led into the tunnel and held it open for his comrades. When everyone had gone down, he followed and closed the hatch. The harsh sound of the rainstorm outside of his room at the McLeary Rest Home threatened to make its presence known inside of the building by its wild slashing of the wind through the branches of an old oak tree. The noise of the thunder did nothing to arouse Nicholas Jordan from his bout with unconsciousness. The darkness behind his eyelids was occasionally disturbed by the electric flashing of his synaptic nerves. The only things that mattered at that moment to Mr. Jordan were the images which played on the screen of his resting brain.